In addition, there’s the specimen that Wilson reportedly collected near Winchester, Virginia ca. 1810 (Jackson) and the central Kentucky specimen reportedly collected in the 1780s (Jackson, accepted by Tanner in 1989). As I see it, the tendency to treat these records as suspect is based, at least in part, on post-Civil War or post-Audubon “knowledge” about the ivorybill and its habitat, rather than anything intrinsically implausible about the claims themselves. At minimum, one of the Ohio archaeological finds dates to the 15th or 16th century, so there’s strong reason to think that the ivorybill’s range extended that far north at the time of contact. North American Native populations began to decline after Columbus’s arrival, and De Soto’s expedition, 1539-1542, led to the collapse of the Mississippian culture. (De Soto also introduced the hogs that plague the southern forests to this day.) As a consequence, countless acres of formerly agricultural lands throughout the eastern United States were reforested and remained so into the 18th and 19th centuries. There’s little reason to think that the ivorybill’s range would have contracted at a time when the total acreage of potential habitat was increasing. I’m reminded that tree girdling may have been an important factor. The only counterargument to the foregoing suggestion about the increase in total acreage after De Soto is that Native American agricultural activity declined drastically during that period, so that while habitat acreage increased, habitat quality may not have. Tree girdling and intentional burning likely played an important role in creating good conditions for ivorybills and could conceivably have led to range expansion during the Mississippian period and again temporarily during the first couple of hundred years of European settlement. From Echoes from the Backwoods; or, Scenes of Transatlantic Life, Captain R.G.A. Levinge (1849). With this as background, I’d like to propose an alternative explanation (or more accurately an alternative group of explanations) for the ivorybil’s decline. If you think, as I do, that the ivorybill has persisted, this may help explain how the species survived and may even provide some hope for its future, even in this era of mass, anthropogenic extinction. Logging and clearance for agriculture are responsible for the dramatic decline in numbers and range. These factors are likely to threaten any remaining population. Hunting has also been implicated in the rapid population decline, and it has been proposed that this was the primary cause of its decline, with habitat destruction playing a secondary role, but this theory is contentious (Snyder 2007, Hill 2008, M. Lammertink in litt. 2012). Tanner emphasized the importance of logging during the post-Civil War era, although several of his data points seem to suggest that ivorybills were disappearing prior to the most active logging dates. He also stated that the ivorybill’s disappearance “coincided at least roughly with a time of active or rapidly increasing logging.” Elsewhere in the monograph, he focused on food supply, and I suspect that this, rather than logging per se was a more important factor in the ivorybill’s decline. That’s not to say logging was unimportant; it clearly played a major role. To expand briefly on the point Bill Pulliam raised: by the late 19th century, the more adaptable Pileated Woodpecker, had been extirpated in many parts of its range, and many expected it to ‘go the way of the ivorybill’. That didn’t happen, and PIWOs returned to or became more common in many areas (my own included) as farming gave way to suburban development and forested acreage increased as a result. I’d suggest that for the ivorybill, habitat degradation, rather than habitat loss, was what initiated the decline, with extensive logging and then hunting accelerating an already existing trend. That is to say, a number of additional anthropogenic factors likely played a role in the ivorybill’s decline and dwindling range, especially outside of Florida, where hunting and collecting likely had much greater impacts than elsewhere. Hasbrouck, writing in the 1890s, contrasted the lack of collecting in Louisiana, Arkansas, Missouri, and Tennessee with what was transpiring in Florida at the time. And it’s important to remember that Florida, which retained ‘frontier’ characteristics far longer than other parts of the eastern United States, was ground zero for the killing and collecting of birds – for commercial and ostensibly ornithological purposes. Ivorybills appear to have been more common in Florida than elsewhere by the second half of the 19th century, but it also seems probable that they were far more heavily persecuted there than anywhere else. I’m hypothesizing that the shrinking distribution was correlated with settlement patterns in the northeastern part of that range and that by the middle of the 19th-century, east of the Mississippi, it had dwindled to the now familiar outlines, such as those shown on the IUCN range map. The situation west of the Mississippi is somewhat more ambiguous. A specimen was collected at Forest Park, Missouri (near Saint Louis) in 1886, and there are records from west of the map in Texas dating to the early 20th century. Nevertheless, the general trend toward a shrinking range, which was frequently described in the 19th century literature, is clear. European settlement brought about numerous changes in the land even before wholesale clearing of forests began. As mentioned briefly in the discussion of tree girdling, Native Americans used fire for agricultural and wildlife management purposes, something that was likely beneficial for ivorybills. As Native Americans were exterminated, pushed out of their original homelands, or confined to small reservations, and as European settlers tried to control or eliminate fires, a significant factor contributing to tree mortality was likely reduced, dramatically. Fulton’s invention of a commercially viable steamboat in 1807 revolutionized commerce, drastically accelerating the clearing of log jams from many watersheds in eastern North America. It’s fair to say that “widespread removal of instream wood for steamboat routes, timber rafts, and flood control was equally significant in decreasing floodplain sedimentation and river complexity, and in causing a fundamental, extensive, and intensive change in forested river corridors throughout the United States.” (Wohl, 2014.) As with changes in fire regimes, this clearing of log jams likely led to a decline in the number of stressed and dying trees along the riparian corridors that seem to have been so important for the ivorybill. Perhaps equally if not more important in my view is the extirpation of the beaver. It is almost impossible to overstate the role of the beaver in shaping ecosystems throughout North America, a subject that’s addressed in engaging detail in Frances Backhouse’s Once They Were Hats. Beavers help create conditions that are good for woodpeckers by stressing and killing trees, through foraging and by changing hydrology. I’ve never tried to quantify it, but many, perhaps most, medium to large sized sweet gums in our search area show signs of beaver damage, and many others have been killed or severely weakened by beaver-caused flooding. While beavers are not native to peninsular Florida, the ivorybill’s dwindling range elsewhere roughly tracks their decline; with extirpation starting in the northeast, moving West, and then South. (Southern beaver pelts were less valuable.) By 1900, beavers had disappeared from most of the southeastern US, and in Tanner’s day, a very small population persisted in the Florida Parishes of eastern Louisiana. Reintroductions began in the 1950s, and beavers are now considered a pest animal in Louisiana. It’s worth pointing out that the introduced beaver population in Tierra del Fuego appears to be benefitting the native Magellanic Woodpecker (Soto et al. 2012). The resurgence of the beaver throughout the southeastern US is almost certainly producing substantially improved habitat conditions in many places. While the old growth forests may be virtually gone, it’s not inconceivable that ivorybill food sources are considerably more abundant now than they were in Tanner’s day, and if the species survived, conditions may actually be more favorable than they were in the 1930s and ’40s. It’s also worth pointing out that the southeastern United States is one of the few places in the world where forest cover has increased substantially in the 21st century. It should be clear to readers of this series that the Ivory-billed Woodpecker inhabited a larger range and was able to exist in more varied habitats than most publications on the species suggest. This has implications for searchers and for what is deemed to be suitable habitat. For example, the trail cam images from the old Project Coyote search area were obtained near the edge of a bean field, and the putative ivorybill roost holes were in willows (more on that in my next post). Since ivorybills in the western part of their range seem to have lived in willow and cottonwood dominated riparian corridors, fast growing, short-lived willows might have played an important role in the species’ survival in other areas too, although willow-dominated habitat would be dismissed as unsuitable under conventional standards of habitat appropriateness. It seems to me that even a slightly higher degree of adaptability would increase both the chances of survival and the likelihood that surviving populations might be overlooked due to preconceptions about habitat “suitability” ; this was doubtless one of the factors that led officials to dismiss the landowner in our old search area. Now that beavers are again abundant in the southeast, habitat that might otherwise have been deemed “unsuitable” may now be able to support ivorybills, even if the forest itself is not very old. While I don’t envision a recovery along the lines of what’s happened to the Pileated since my youth (when seeing my first one was a thrill as much for its scarcity as its beauty), I think it’s possible that ivorybill numbers have been increasing gradually and modestly over the past few decades. There was, of course, fairly intensive searching from around 2000-2010 (though it’s mostly over now), but it may be that the more numerous sightings from this period and afterwards are due to more than just the increased effort. covered from the eastern area of the Great Lakes (Ohio, Indiana, and Michigan). A number of these midden records were accepted by Tanner in his unpublished 1989 update. Bottom line upfront: In pre-contact and early colonial times and into the 19th century, Ivory-billed Woodpeckers inhabited a more varied and expansive range than most people realize. The range probably reached from the southern tip of Florida to central Ohio, with the 40th parallel as the approximate northern limit, westward to St. Louis and perhaps along the Missouri River. As discussed in the previous post, the western limit of the range appears to have been somewhere around the 96 or 97th Meridian, in the southwest, and probably somewhat farther east at the northwestern edge, if unproven historic reports from the Kansas City area are valid. Outside of coastal areas, distribution appears to have followed riparian corridors to its outer limits, and there are no records from elevations of over ~1000′. 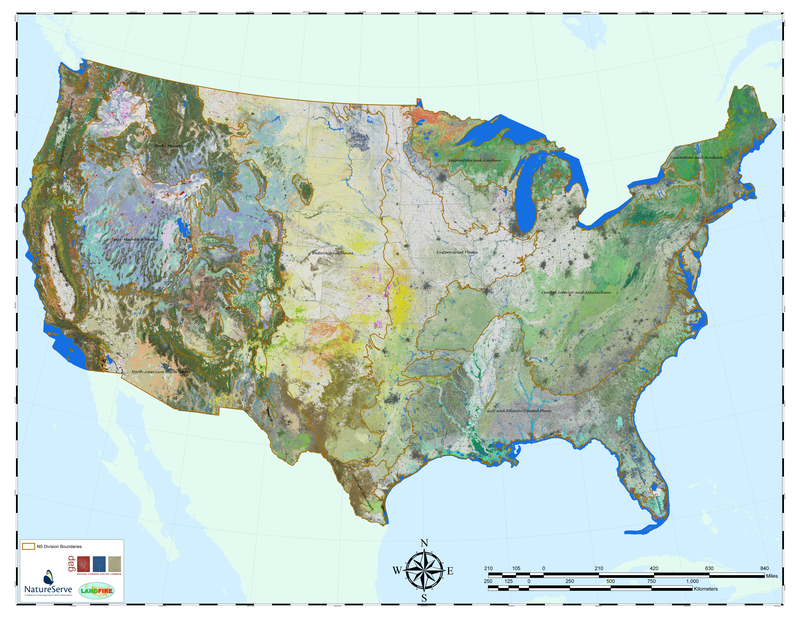 A couple of maps may be useful for additional information about forest, bioregion, and habitat types and may help with visualization along with my map of records from unexpected habitats. This is a new avenue of exploration for me, and I’m not personally familiar with many of the areas involved. I need to do additional research on areas within Tanner’s range map, along the coasts and in Florida, to be sure my characterizations are accurate. I’m leaving some of these locations on the master map for now (but removing them from the graphic below which includes extralimital and edge of range records). The master map is thus subject to change, so view it with the caveat that the notations may be incomplete or inaccurate. This post will address locations that are outside the confines of Tanner’s 1942 range map, although he accepted some of these records in 1989. As in the previous post, my analysis relies on records accompanied by reported physical evidence (even if that evidence has been lost) and to Native American sites where remains found are deemed unlikely to have been trade items. I relied on the US Fish and Wildlife Service’s Recovery Plan, Appendix E, Tanner, Jackson, and a few additional sources. In fairness to Tanner, he didn’t characterize cypress as being abundant in the Tract. (It was not.) And his overall view was that cypress-tupelo swamps were not good ivorybill habitat. Audubon, with his romantic, indeed gothic, language is the father of the cypress myth. I wish, kind reader, it were in my power to present to your mind’s eye the favourite resort of the Ivory-billed Woodpecker. Would that I could describe the extent of those deep morasses, overshadowed by millions of gigantic dark cypresses, spreading their sturdy moss-covered branches, as if to admonish intruding man to pause and reflect on the many difficulties which he must encounter, should he persist in venturing farther into their almost inaccessible recesses, extending for miles before him, where he should be interrupted by huge projecting branches, here and there the massy trunk of a fallen and decaying tree, and thousands of creeping and twining plants of numberless species! Would that I could represent to you the dangerous nature of the ground, its oozing, spongy, and miry disposition, although covered with a beautiful but treacherous carpeting, composed of the richest mosses, flags, and water-lilies, no sooner receiving the pressure of the foot than it yields and endangers the very life of the adventurer, whilst here and there, as he approaches an opening, that proves merely a lake of black muddy water, his ear is assailed by the dismal croaking of innumerable frogs, the hissing of serpents, or the bellowing of alligators! Would that I could give you an idea of the sultry pestiferous atmosphere that nearly suffocates the intruder during the meridian heat of our dogdays, in those gloomy and horrible swamps! But the attempt to picture these scenes would be vain. Nothing short of ocular demonstration can impress any adequate idea of them. Hasbrouck’s explanation of the Missouri extralimital records is odd. The locations given are well outside bald cypress range. That aside, the myth discussed in the previous post is a composite. The emphasis on cypress originates with Audubon and Hasbrouck, and the emphasis on large tracts, old growth, oaks, sweetgums, and tree size is largely drawn from Tanner. Reedy River, South Carolina: Nest with eggs reportedly collected in 1896 and later lost. The location is in the Piedmont, south of Greenville, at an elevation of approximately 900′. The Reedy flows into the Salad, which flows into the Congaree. This report is listed in the Recovery Plan because it was accepted by Sprunt as “definitive” but is considered highly questionable. Etowah Mounds, Georgia: Pre-contact site, elevation approximately 700′. Presumably not trade goods “but requires further discussion” per the Recovery Plan. The Etowah River is at the northern end of the Alabama River watershed. Between Martinsburg, West Virginia and Winchester, Virginia: Specimen reportedly collected by Wilson ca. 1810. Elevation at Winchester is 725′ and at Martinsburg is 453′. This would appear to be in the Potomac watershed. Moundsville, West Virginia: Two lower mandibles found in a pre-contact (early Common Era, 0-200) midden. Potentially trade goods. Elevation 696′. The location is on the Ohio River. Philo, Ohio: Near the Muskingum River. Tarsometatarsus found in pre-contact midden, dates from ca. 1100-1500. Elevation 735′. Sciotto County, Ohio: Same as above. Elevation of the site is 1050′, but the nearby Sciotto River is lower. The site is about 10 miles from the Ohio, and the elevation at the confluence is 533′. Near Troy, Ohio: Near the Miami River, March 1804 sight record by Gerard Hopkins, a Quaker envoy to the Miami and Pottwatomi. The report includes a description, “. . . resembling the red headed woodcock of Maryland, except that its head is black and its bill ivory. ” (Leese 2001). Omitted from the map because it doesn’t involve a specimen, but included here because it adds weight to the archaeological records. Franklin County, Indiana: Report of a specimen, 1869, now lost. Elevation at least 490′. Probably along the Whitewater River, an Ohio tributary. There are a number of early reports from Indiana, but no other reported specimens and no archaeological records. In light of Audubon’s collection at Henderson, KY (just across the Ohio River) as well as the Ohio records, it seems likely that ivorybills were present in parts of Indiana into the 19th century. Henderson, Kentucky: Female specimen collected by Audubon in July 1810 and used as a model for his first painting of the species. Elevation 400′. This record does not appear in the Recovery Plan or Jackson, and it seems to have been overlooked by researchers. Audubon’s own notation describes the location as “Red Banks”, on the Ohio River at the northernmost limit of the cypress-tupelo association, well upstream from the confluence with the Mississippi. Article by R. Haven Wiley in Kentucky Warbler, May 1970. Stanford, Kentucky: Pair reported, with one specimen collected by a Colonel Fleming, 1790. Record accepted by Tanner in 1989. Elevation 942′. The Dix River, which flows into the Kentucky and thence the Ohio, is nearby. Cahokia Mounds, Illinois: East of the confluence of the Mississippi and the Missouri, 1500s or earlier, tarsometatarsus. Elevation 490′. Forest Park, Missouri or Vicinity: West of the confluence of the Mississippi and Missouri. Specimen collected 1896 and in the collection of the Colorado Museum of Natural History. Elevation approximately 500′. I find it interesting that Ohio is the state with the most pre-contact records involving likely food items – 3 out of a total of 4-6. With regard to Missouri and the Missouri River watershed, Hasbrouck accepted reports from Fayette and Kansas City, and given the overall picture, this does not seem implausible. In addition, there were persistent reports from the vicinity of Lake of the Ozarks, in the Missouri River watershed, until the end of the 1940s; Tanner received information about Missouri reports from local Audubon society officers but apparently disregarded it. There’s no way to assess the validity of these old, anecdotal claims and no evidence to support them, but given this perspective on the historic range, they may be somewhat less far-fetched than it seems at first glance. I’m heading for Louisiana soon. More after I return – a trip report and probably two additional installments.